Created in beautiful ivory lightweight cardstock with green foil, these notes are blank on the inside. Note: the imprint color is solid kelly (and not varigated, as shown). Whether you would like to mail it yourself or have us include one in a gift package, we can now offer these cards separately. 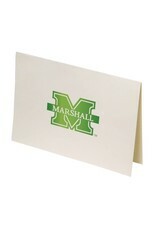 If you would like, we will hand-write your personal message on the card to be included in your package. Please enter the message in the space above (100 character limit, please).